The importance of choosing the right shower is often underestimated, considering that showers are used every day or even multiple times in family households. So when setting out to buy a new shower, some thought should be given to users’ actual needs and requirements. But how do you recognise a high-quality shower and the value it adds to the average shower experience? Showering habits are highly personal and everybody has different preferences. Bathrooms differ greatly as well, If people hardly ever give a thought to what they expect of a shower, they should not be surprised to find that they get little enjoyment from their shower. Luckily there are a number of objective criteria which set apart a high-quality shower from a run-of-the-mill product. Any shower will spray water in some form or other but not necessarily in the desired direction. Experience shows that many showers of inferior quality start spraying water all over the place within a few weeks or months from purchase – or their nozzles simply get clogged and let hardly any water pass through at all. All of which costs users time and money. This is why all GROHE showers have advanced shower engines that ensure equal distribution of water over all nozzles. The GROHE DreamSpray® shower engines guarantee 100% shower enjoment through technological innovations. So even if an inferior shower may come at a lower retail price, it’s important to consider that its total costs will usually turn out to be much higher over the long run, particularly because of its shorter lifetimes and its higher water consumption. Aside from that, showering with a perfectly working shower head is simply a lot more fun. Before a GROHE shower is installed in a shower cabin, it has already undergone an intensive period of design and development, as well as high tech manufacturing process and an extensive quality assurance programme. The result is a product which combines comfort with sustainability, i.e. optimized weight and easy handling on the one hand plus a long service life and reliability on the other. What could be more annoying than constantly having to repair or even replace your showers? Clogged up nozzles and the frequent cleaning they require can also detract from the shower experience. This is why GROHE has developed the GROHE SpeedClean technology. This special anti-lime system for shower heads not only prevents limescale buildup but also facilitates the cleaning of the nozzles,made from a special silicon blend. Any limescale deposits can be removed simply by wiping across the shower face with a cloth or even your hands. A hot shower can be a wonderfully relaxing treat as long as there is no risk of scalding from an overheated shower head. Safety takes top priority particularly for families with young children and toddlers. Prudent parents should choose a GROHE shower with integrated scalding protection. This can come in the form of either automatic control of the hot water temperature with GROHE thermostats or through smart channelling of the hot water through the mixer and hand shower grip (the Inner WaterGuide), thereby creating an effective barrier between the hot water and the chrome surface which consequently remains at a pleasant temperature. This GROHE CoolTouch® technology means that even children and older people, for whom controlling the water taps may be a challenge, can enjoy their shower with full peace of mind. The healing and soothing powers of water have been known since the dawn of civilisation. GROHE continues this long tradition by offering showers equipped with different spray patterns. Depending on current needs and the mood of the moment, the showers can be switched from the normal spray to a massaging, pulsating, caressing or refreshing spray. This allows the shower to be used for an energising kick in the morning as well as for relaxation after a stressful day in the evening. The latest innovation is the GROHE Bokoma Spray®. This actively expanding and contracting circular massage spray pattern complements the tingling air-infused GROHE Rain O2 spray, the generous Rain spray, the gentle Pure spray and the bubbly Champagne spray to turn the shower cubicle into a source of wellbeing for body and mind. Human skin is a very sensitive organ, so the water temperature has to be set correctly and individually. High quality thermostats with modern technology operate reliably and efficiently. GROHE is widely regarded as the world wide pioneer with respect to sophisticated thermostat technology. Incorporating GROHE TurboStat® technology, GROHE thermostats react faster then ever before and are at the same time extremely accurate. 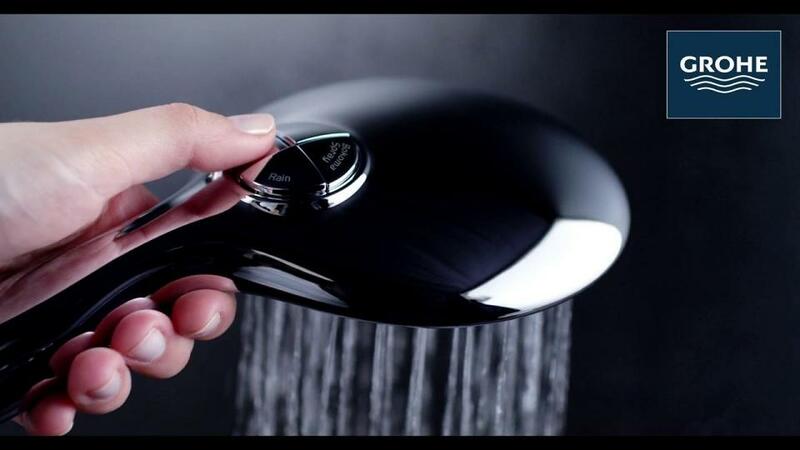 They adjust the water temperature to the preselected level within fractions of a second and maintain it incessantly for the duration of the shower by responding instantly to any fluctuations in the water pressure. The result: no more of hot and cold surprises under the shower. Those who are not content with switching between different spray patterns can choose a complete shower package or even a customised shower system to turn their bathroom into a personal wellness oasis. A luxurious three-dimensional shower experience can be created by combining a large-sized head shower with matching hand and side showers. Digitally controlled light and sound modules are available to add luxurious spa feel to residential bathrooms. The great variety of fittings and modules means almost complete freedom in designing cubicles and enclosures for the ultimate shower enjoyment. What else can buyers of a GROHE shower rely on? Most importantly, these showers have German engineering and ingenuity in their genes. The company’s global manufacturing standards are set in Germany, which is where its expertise in high-quality plastic showers resides. All innovation processes are launched in, and coordinated from, Germany. All products are engineered in the company’s German research and development centre and designed by the internal GROHE design team. Extensive test procedures are used to test all new products far beyond current industry standards and to define quality assurance parameters which ensure that only immaculate products are shipped from the company’s manufacturing facilities. Engineered with utmost attention to detail and designed to harmonise with any decor, GROHE showers are small works of art which add great value to bathrooms of all shapes and sizes.